Tourtiére is a traditional addition to the holiday table. It's also perfect for busy weeks since it can be made ahead, baked, frozen and reheated. Tourtiére is a traditional addition to the holiday table. It's also perfect for busy weeks since it can be made ahead, baked, frozen and reheated. The spice and meat combination is a very personal thing in Québec, with each family having its own preferred blend. We hope you enjoy this one. In a large saucepan, soften the onions, garlic, and celery in the oil. Add the meat and cook for about 15 minutes until it is fully cooked and crumbling. Add the ground cloves, cinnamon, nutmeg, salt and pepper. Add the potato and broth and cook for another 20 minutes or until the potato is cooked and falling apart. Remove from heat and add a few tablespoons of breadcrumbs to absorb the fat. Allow to cool to room temperature. Place filling into bottom crust. Brush edge of crust with cream or egg wash. Top with upper crust and seal edges. If decorating the top, apply pastry details with extra cream or egg and chill for 30 minutes. Otherwise, if applying a full crust, cut a few slits in the top of the pie to allow steam to escape. Brush with the cream (or make and use an egg wash). Bake at 400F degrees for 50 minutes or until crust is golden. Alternatively, make 4 smaller hand pies, which will be done closer to 40 minutes. Bake pie as per directions above. Allow to cool to room temperature. Wrap in plastic wrap and foil, then place in freezer. 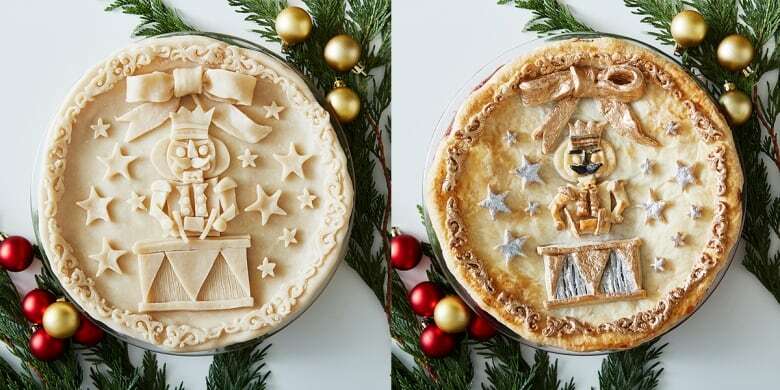 Frozen pies will keep 4-5 months. To reheat from frozen, do not thaw first. Place cooked pie onto a baking sheet directly into 350F degree oven for 40-45 minutes, until centre of pie is hot when tested. Your holiday feast menu — and all of the recipes — are here!